A big part of owning an Apple Watch is downloading apps for the device. While the Apple Watch can be great for doing things like monitoring your steps and keeping up to date on email and text messages, where the wearable really shines is with the apps that you download for it. There are tons of basic apps for the Apple Watch like Google Maps and Yelp that everyone will download immediately, but there are also a few unique gems out there that are worth a look. Here are few of our favorites. You haven't quite lived until you've unlocked the door to your hotel room with your Apple Watch. Starwood Hotels partnered with Apple on its app, making it one of the first available for the wearable. With the Starwood app, you can do things like check into the hotel, view you hotel points balance, and even unlock your hotel room at some location. That's right, you can unlock your door with your wrist. That means you don't have to worry about losing your keys ever again, nor do you have to struggle with pulling your wallet out and finding your key card when you make it back to your room at the end of the night after a day of exploring. It seems like a rite of passage for new devices to get the classic game Pong. “A Tiny Game of Pong” brings the 1970s classic to your wrist. Gameplay is possible thanks to the Apple Watch’s digital crown, which you use as a controller while you play. Once the $.99 game starts, you’re looking at a game almost identical to the 1970s classic you are probably used to. Since you’re (obviously) playing as a single player, you’re only able to control the paddle on the bottom of the screen. The paddle on the top of the screen is controlled by the computer. To control your paddle, you turn the digital crown, which moves the paddle on the screen from right to left. Simple enough, right? We dare to you to try it and not get addicted. Are you always wondering who sings a particular song? Shazam is one of those Apple Watch apps I find myself using much more often than I would have expected that I would, in part because it really is that useful. The app performs the exact same function as the iPhone version: it listens to a song that’s playing and tells you who the artist is. When a particular track comes on the radio; however, it can be hard to pull out your iPhone, navigate to the app, and start having it listen before the song is over. I know, I've tried (and filed) more times than I care to admit. With the Apple Watch app, the icon is much easier to find (for me), and the app launches quickly enough that I rarely miss capturing a tune. You don't have to purchase the Nike+ version of the Apple Watch in order to take advantage runs, and helps you train for things like 5ks or marathons. Similar to Nike’s iPhone app, the Apple Watch app will track the location of your run on a map, and provide information about your run such as the total distance you traveled, amount of time you were running, and how many calories you burned along the way. You can also look back at your last runs and see how this one compares, and see Cheers from friends while you’re out on the road. The app works with all of the versions of the Apple Watch, so you can still hang with your friends that might have opted to purchase the Nike+ version of the Apple Watch Series 2. This day in age, security is something everyone should be thinking about when it comes to their online accounts. If you haven’t already tried out 1Password, you should. The service stores the passwords for all of your services (think your banking info and email password), and then allows you to access them using one single password. So, while you might have a crazy 30 character password set up for your checking account, and another crazy one set up for your Gmail, you’ll be able to get into both by just using your one password and more important, hackers won't be able to.The Apple Watch app brings that same functionality to your wrist, which can be particularly useful in situations where you’re traveling (or using a coworker’s computer), and need to get access to one of the services you have setup with 1Password. Remember the days or trying to keep your virtual pet alive while you were in school? The Apple Watch has its very own Tamagotchi app. Just like the Japanese keychain you carried around in the 90s, the app allows you to hatch your own pet Tamagotchi and then feed and nurture it into adulthood. The watch app works alongside Tamagotchi’s existing iPhone app. With it you’re able to check the status of your pet at any point throughout the day and you’ll receive a notification on your watch if your Tamagotchi needs something. For things like feedings and bathroom breaks you can even initiate those actions from your wrist. Curious how you’re sleeping at night? Sleep++ is an app that transforms your Apple Watch into a sleep monitor. When worn at night, the app will track how long you managed to stay asleep, as well as information like how restless you were during that slumber. It's sort of like how FitBit and other fitness trackers handle monitoring your sleep. Given the Apple Watch's current battery life, this one can be an awkward one to use just because it means you'll almost certainly wake up with an almost-dead Apple Watch, but if you're curious about your sleep taht might be worth it a few days a week. H ave you always wanted to work for NASA? Now you can...sort of. Lifeline is a choose-your-own-adventure game that was made for the Apple Watch. In the game, you’re chatting with someone who has crash-landed their ship on an alien moon. The game goes on throughout the day, just as if this person really exists, and you’re tasked with giving the person instructions on how to proceed. It can be a lot of fun, especially if you’re stuck in a desk job and need a casual distraction throughout the day. A few good games on your Apple Watch can make experiences like standing in line or commuting on the train much more bearable. If you’re a fan of word games, then Letter Zap is likely to one of your new favorites. The addictive game has you unscramble as many words as you can within a 30 second timeframe. All the action can happen on your wrist, and the game keeps track of your personal bests so you can try and improve over time. It's super addictive, and definitely worth a look. Weather is one of those things that effects us all.Once you try out Weather Nerd you’re likely to not look at other weather apps the same ever again. The app is powered by the (awesome) iPhone app Dark Sky and provides detailed information about the weather where you are. The app includes three different panes: one to show you what the weather is like today, one for this week, and one that drills things down to the hour so you can plan out the rest of your afternoon. Slack has made it possible for virtual offices to popup everywhere. If you work for one of the countless companies that are currently using Slack for their business communications, then you’ll love the service’s Apple Watch app. With Slack for the Apple Watch you’re able to see your direct messages and mentions right on your wrist. You can’t compose a response on the Apple Watch, but if you tend to answer questions with relatively similar answers often, you can save some prewritten responses that you can select from your wrist and send. The app also supports voice input using Siri (for those quick responses you don’t have saved already), as well as emoji. At this point you've probably booked a hotel on your phone, but have you booked a hotel room using your watch? Whenever you're searching for a last-minute hotel room Hotel Tonight can help you find a hotel room where you are, often at a considerably discount than what you would pay for the same room on a normal basis. Need to take a selfie, but don't want your arm in the shot. We understand. This one is a must-have for selfie takers. The app works just like you might expect, and serves as a remote shutter button for your iPhone. With the app, you can set your iPhone up wherever you want. Once positioned, you’re able to see what the camera sees on your wrist, and frame the picture perfectly. Once you’re ready to capture a shot, you can press the shutter button on your wrist rather than having to go up and touch the camera. The result? Much better selfies. Even more exciting, the app also has a countdown option, so you have the opportunity to put your hand down once you press the shutter and don’t end up with a ton of shots of you touching (or looking down at) your iPhone. 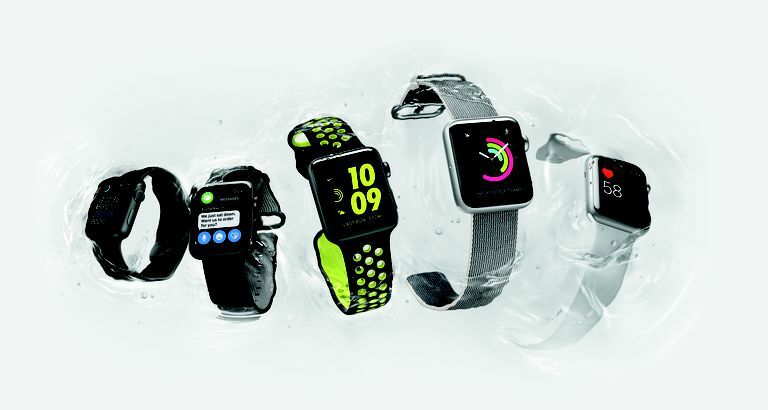 Is The Apple Watch Right For You?